The zig zag edge created by pinking shears is more than just a decorative finish. Those little triangles notches are actually pretty useful . Chris from Pickup Some Creativity explores the more functional uses of the notched edge. It’s part of her Sewing 101 series. 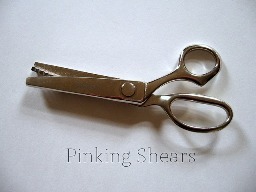 If you don’t already own pinking shears, you’ll be running out and getting some after reading her tips. Read all about it at Pickup Some Creativity.